Action: The 'vitality pool' at Baynan Tree Koh Samui. Precise pampering: Banyan Tree, Samui. Giving a balanced, fair comparison between a five-star hotel spa treatment in a resort vast enough to have its own postcode and a dirt-cheap Bangkok massage shop was always destined to be a perplexing challenge, finds Steve Madgwick. Two polar-opposites of ‘nuat phaen thai’, traditional Thai massage, I thought – sort of like contrasting a crisp recording of artfully played harp music with Britney Spears’ on repeat, crackling through tinny street-stall speakers. Well, actually, that was one of the differences I discovered when I put my body (and ears) on the line for this massage road test. The most obvious inequity in the comparison is, of course, the price canyon between the two treatments. For a one-and-a-half hour treatment at the ‘Rainforest’ spa at the (five-star) Banyan Tree Koh Samui (of which I was an invited guest) I could have been pummelled, bent and stretched for around 28 straight hours at Yens on Silom Road, a 250-baht (about $10) per hour massage shop that ended up being my comparison. But I had to focus on what the two treatments had in common so I chose the traditional Thai-style massage at both, medium pressure and with no oil (too hot and humid in Thailand). First up, the Rainforest set a lofty standard. The Banyan Tree Koh Samui is a ‘well-being’ destination even without a massage – its sublime aspect over the Gulf of Thailand only partially ‘interrupted’ by palm groves. When it was time to leave my Deluxe Pool Villa for my treatment, a chauffeured buggy picked me up and dispatched me at the spa’s foyer. Unfair advantage indeed. The Rainforest is marketed as a “hydrothermal therapy and wellness experience’, akin to an upmarket holistic health funpark. Even the massage preamble is extensively planned, as you would expect given the tariff. The spa’s reception feels calm: custom-scented, temperature controlled, music audible yet not intrusive, intense service. Sadly, treatments don’t take place within the actual confines of a rainforest – it’s actually a purpose-built spa building, a multi-disciplinary stroll through a series of rooms that flit from hot to cold chambers of pleasure and panic, water bombarding, squirting and pouring from surprising angles. The spa attendants herd you through each mysterious chamber at an invigorating and sometimes chaotic pace. 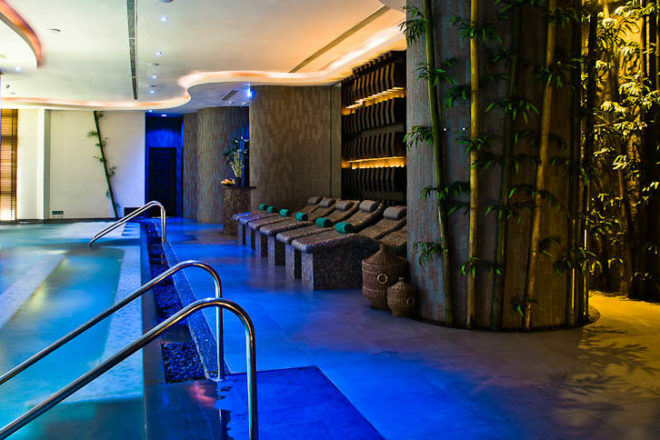 There are 16 pre-massages disciplines, including those in the ‘vitality pool’. Some I found invigorating: the mild steam room, with lemongrass-scented mist, warm ambience in near darkness; the abrasive and stimulating salt scrub; the poundingly powerful pool jets. Some not so: the ice shower and the tip-the-wooden-bucket-of-water-on-yourself room (the staff had to repeatedly prompt me before I submitted to the holistic hari kari). A pre-massage recline on heated tiled loungers, cocooned in towels, embryonically warm, was a measured transition for my massage. Less than 48 hours later, in armpit-humid, bustling and dusty downtown Bangkok, I searched the streets for the Rainforest’s low-cost opponent, a ‘respectable’ massage house – not one of ‘those’ kinds of massages ubiquitously available in Bangkok. Yens’ aura sold me straight away: in a row of wholly respectable establishments; no hard sell, no overly-made-up giggling ladies (or lady boys); fluorescently clean; prices clearly displayed. The male receptionist and I communicated with a pantomime sign language, motioning back and forth at the massage menu, locking in my hour-long massage. The enthusiastically illuminated ground floor gave way to a barely lit, seemingly disused, second-floor room where my masseuse, unusually tall for a Thai man, noiselessly led me through to a small room with two raised, curtained-off massage chambers. From this point, the two treatments at least bare some comparison. As is custom in nuat phaen thai, the masseuse first washes and scrubs your feet. At Yens, the water in the plastic laundry tub was lukewarm but the masseuse’s scrubbing was energetic and thorough. He managed to avoid activating my tickle reflex, unlike at the Rainforest. Skillful. My ‘medium pressure’ request was slightly lost in translation at Yens, thumbs and elbows digging into my calves, provoking spasms and flinches, knees in my back a sharp reminder that this is a full-contact “assisted manipulation” massage, not just a light back rub. But my masseuse speedily became adept at knowing my limits, never eliciting an “ouch”. Neck and back manipulations (my principal foes) were handled in a sensitive and professional manner. The vinyl mattress underneath me squeaked with intensity during the hour, Bangkok’s traffic chaos was also just noticeable, less so after the ‘massage coma’ took hold. The ambient music at Yens… well… not so ambient; boy bands from the 90s, including Backstreet Boys followed by a couple of numbers from Britney, on repeat. Distracting, yes, but not loud enough to ruin the entire experience. Back at the Rainforest, the water in the ornately decorated foot-scrub tub (filled with rose petals and lime slices) was warmed to my liking. Precise: no distracting din; dark wood and cane furnishings; calm voices. The Banyan Tree masseuse (who later told me she had recently finished 5 months of formal training and had three years’ experience) possessed the power of someone at least two-and-a-half times her size, teetering on the limits of medium pressure also as she pursued knots around my lower back. She gently obliterated them, sleep beckoned. The techniques of both practitioners obviously share common heritage, the Banyan Tree’s more precise, practiced, disciplined; Yens closer to free styling, raw, but ultimately satisfying. The post-massage routine underlines the differences as much as any element. At Yens the masseuse quietly rose, a vague tap on the back, wandering off without a word, leaving me to find my shoes and navigate my way back downstairs, where he was standing outside waiting for the next customer. I wondered how many massages he would perform in one day and what toll that would take. By contrast, the gentle peal of a bell woke me from my massage coma at Banyan Tree. And the pampering continued: fruit and yogurt, more tea, water, all served in branded vessels. One distracting point, however, was being asked to fill out a survey, rating my masseuse’s performance, before I had even left the room. The winner. The Banyan Tree overall, even considering the fee, but to bastardise a sporting cliché the “only winner on the day was the massage itself” – and me. Sure it’s great to splash out and be pampered, but it’s also good to know that just down the street you can get a vaguely similar experience for less than a price of a bottle of wine.